Mega Sale! Save 30% on the HLC Classic Plant Stand Shelf Holds 3-flower Pot Bronze by HLC at Tulips Orchids. MPN: MC0135HP. Hurry! Limited time offer. Offer valid only while supplies last. 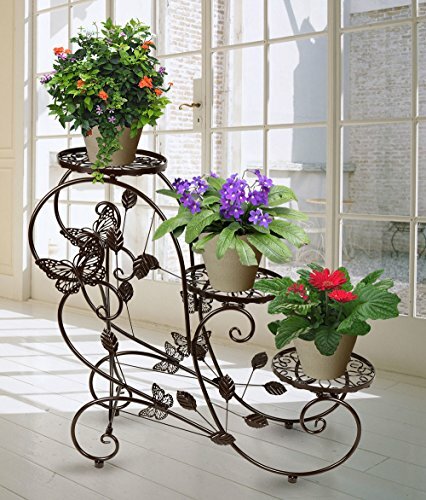 Color:Bronze APerfect classic and modern combination:this typical 3-tier Classic Plant Stand grands you visual enjoyment with flowers and ''S'' design. Perfect classic and modern combination:this typical 3-tier Classic Plant Stand grands you visual enjoyment with flowers and "S" design. Super space-saving design:3-tier potting areas and "S" allow for large positioning of the plants. Versatile functions:the three-layer set-up further enhances the versatility of this unique piece. Size: 28.7" *10.2" * 26.5". Classic 3-tier shelf plant stand with modern"S" design. Size: 28.7" *10.2" * 26.5", Weight: 8.4 LBS.